WayHome attendees who didn't make it out to Jazz Cartier's performance were subject to choruses of "You missed it??" for the duration of the day. After all, when everyone you know is confined to a campground for the weekend, word tends to spread like wildfire — especially when an afternoon set results in a stampede, brooms being flung into the crowd and a performance moving from the stage to a poutine truck. Jazz Cartier put on a show. In the middle of his set list, the performance of "Dead or Alive" began with Cartier eyeing the food trucks in the distance, with special attention given to the poutine vendor. Musing about how the crowd would fare with moving the performance across the field, the Toronto rapper had tapped into the underlying energy that the long day's sun had suppressed in the majority of the crowd. The moment he said to move, every single person in that audience ran for the hills. 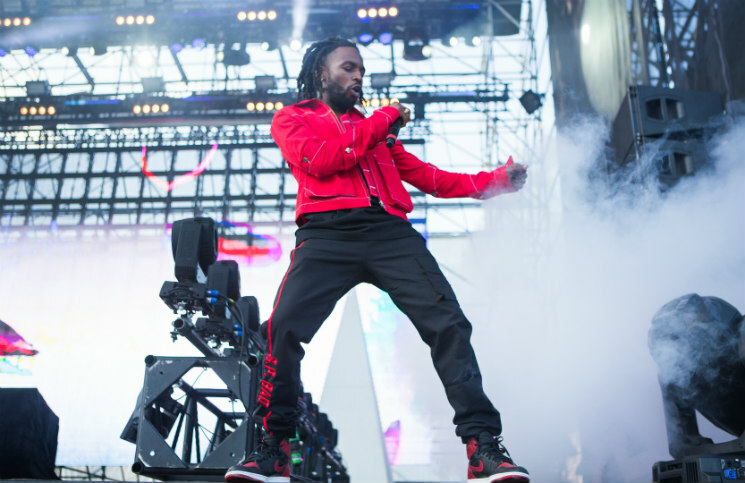 Cartier knows how to turn a show into a spectacle, and those in the crowd who missed it would sorely regret the flash mob that Cartier compelled from his performance. In addition to a his monumental set, Cartier announced that a third mixtape was forthcoming, titled Fleurever, set to follow the critical acclaim of his Marauding in Paradise and Hotel Paranoia. Pick up Hotel Paranoia and Jazz Cartier merch via Umusic.